Much like NYC, the Midwest has its own crazy brand of humidity and oppressive heat. Real talk, I don’t remember the last time I dried my hair. There is no point. Literally none. To complement my DGAF approach to my hair, I have come up with an equally easy summer beauty routine for my face. Admittedly I’ve never worn much makeup, but there is nothing like a heat index of 114 degrees fahrenheit to make you rethink putting on foundation or doing anything but dying. 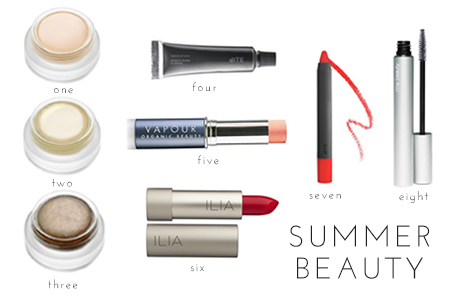 Here are my tips for summer beauty to look hot but stay cool. See what I did there? Since the beginning of this year, I have been on a total rampage to clean up my makeup kit to only include clean products. If you’re new here, I have an obsession with green everything. I have enough working against me already, and I don’t want to be putting toxins on my skin. Plus, I like being neurotic (kidding). If you’re new to the game you can check out my archives here or check out Credo Beauty’s handy Clean Beauty Swaps. On your typical day, I’ll conceal my eyes with the RMS un-coverup, fill in my brows, throw on a few coats of mascara and use some highlighter. When I’m feeling fancy, I’ll add some bronzer and blush to the equation. Recently, I’ve been into my first routine with a bright lip because it makes it look like you’re wearing a lot of makeup and that you’ve put some effort in. You don’t need to tell anyone you actually put the lipstick on while driving. That can just be our little secret. I’m really loving the cream blush and bronzer. They’re super hydrating without making my face feel greasy. Also, since it is so freaking hot, they don’t run or look ridiculous if you’re sweating like a whore in church and added bonus, they look super natural. When you get the hang of applying them, you’ll look like a Victoria’s Secret model. The best part about this, is that it is easy and combined with my low maintenance hair, I’m ready to go in 15 minutes. Which is good, because this girl is interested in sleep.